Shepard Fairey: Inspiration Or Infringement? The Associated Press has threatened to sue the artist who created the iconic "Hope" poster of Barack Obama for copyright infringement, but Shepard Fairey says his work is protected under the principle of "fair use." Shepard Fairey: Inspiration Or Infringement? Fairey's portrait of Obama was installed at the National Portrait Gallery in Washington on Jan. 17, 2009. 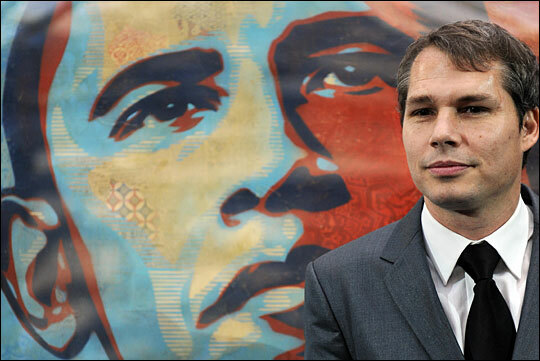 The Associated Press has threatened to sue the artist who created the iconic "Hope" poster of Barack Obama for copyright infringement, but Shepard Fairey says his work is protected under the principle of "Fair Use," which exempts artists and others from some copyright restrictions, under certain circumstances. Fairey based his poster on an April 2006 photo of Obama taken by AP photographer Mannie Garcia. Last month, the AP contacted Fairey threatening him with a lawsuit for using the image without permission, seeking payment for using it, and asking to share in the profits from it. Pre-empting the suit, the Stanford Law School's Fair Use Project filed a lawsuit on behalf of Fairey stating that his work is protected under Fair Use. Fairey is the founder of Studio Number One, a Los Angeles-based design company; he's created album covers for several bands, including the Black Eyed Peas and the Smashing Pumpkins. He joins Fresh Air to talk about the image, the dispute, and why he thinks his poster qualifies as a protected work under Fair Use provisions.